Raoul Pal, Co-Founder and CEO of Real Vision, explains the exciting new changes to our video platform and how this new approach will help us further democratize financial information and allow you to easily find the content that’s personally important to you, whether a seasoned or budding investor. Fantastic informational. Brilliant anecdote on the golfing. Raoul, good overall message and I appreciate what you are trying to do but please continue to focus on quality as well as quantity. Also please don't emulate the CNBC ,talking heads,game show and useless banter formats. I have been a subscriber for some time and have noticed and appreciated your willingness to try new things and focus on continuous improvement please continue that journey. Raoul Pal please promise that as you guys get bigger your quality content stays that same and that is professional's "honest" opinion of the industry and markets. The bigger you guys get, eventually all your guests have to be even more careful to watch their wordings in interviews for all kinda of reasons, that may lead to the possibility of the standardised for the mass opinions like CNBC or other current media news that provides a glimpse instead of insight to current finance and economic events. Gotta balance this well Raoul! Thank you, Real Vision team. As always, Raoul the man. I have been with RealVision since the start....It has given me the leg up over my peers in every metric. Introduced me to Cryptocurrency in 2014 and because of that I have been directly involved with 3 major blockchain projects (DASH, PIVX and now VEIL. RealVision has been the catalyst that taught me that #1. People are the key #2. The guests and hosts all want us to succeed and #3 Their guests are real people. .....This platform has been an equalizer. I will remain a lifetime subscriber. I have to thank Raoul and Grant.....Real Vision has been the education I never knew I was missing and has made my life better in almost every way....I learned a new way to think. 10 thumbs down for this message? Really what did you disagree about? That is the best mission statement i have heard in finance for a very long time. Raoul and Co and the IEX - guys Brad etc showing the way. Ok, so where is all the new content? Or have I just become a member to see you letting a lot of freebies in, so that you could make an extra buck? The content is coming... and we do run and business, not a charity but your assumptions are way off mark. We actually care about what we do and about our subscribers. Are you new to Real Vision? Yes, the comments section is priceless! Can I email this message to my niece and brother who might be interested in this web site? good for you man. America needs financial literacy. my full support. tell Grant I really enjoyed his grey wolf presentation..
New layout on the website is much less usable for me, personally. Still waiting on the ROKU app. Definitely dropped Adventures in Finance after the switch. Not a finance professional and never have been / will be, but I liked the 'classic' content much better than the stuff that's been added. I am so happy with what you have done with Real Vision since I first subscribed to the Real Vision idea before there was anything to watch. It was my high respect for Raoul and Grant that gave me confidence that this service would be great. I am very excited to what the future of Real Vision will bring. Congratulations to all who work at Real Vision. Hope you will cover crypto currencies and block chain development. Great golf anecdote Raoul. Thanks for the explaining the exciting new changes to RealVision and success! Nice one guys! As a weathered financial professional its great to hear there will be more content for people starting to want to think about making their own financial decisions. I always encourage friends and family to own a part of their investment and economic decisions by asking questions like where are we in a business cycle? and how does behavioural science play a role in my decision making? Introducing them that lighter content would really help. Shows like the knock-on-effect are fun and clever ways to just question how things are all interconnected with that global macro overview and practice first principle thinking. Looking forward to referring more future realvisionaries ! Raoul has previously given these much appreciated updates when RV has revised their strategy. One of RV’s strengths, IMO, has been to experiment and tweak their growth plans based upon the loyal RV’ers feedback. I have no idea what RV is going to look like in 2-5 years time, but am firmly convinced that the RV founders, based upon our continuous feedback, will put forward an amazing product. In RV I trust. Sounds good. I certainly think it wouldn't hurt to provide for less experienced investors by having presentations on things like how capital markets work, or how to evaluate companies as an investor, or how to avoid common investment pitfalls. It would also be nice to see more women interviewees, in what is clearly a male-dominated industry. How about asking Gwen Preston to do an in-depth presentation on how to evaluate mining companies. Maybe have Pippa Malmgren back again, too. We are working with 100 women in finance to do just that. It is very important to us. Thanks! I’ve found RV to be one of my top learning experiences. I’m very grateful for the knowledge you bring to those of us who are more looking through the window of investing than sitting in the room of investors. I also want you to know that I’m pleased my subscription is going to help fund what I’ll refer to as “scholarships” for a broader student base. The world doesn’t need more experts. It needs more knowledgeable people. Thank you for that. All the best to everyone. Very worthwhile and ambitious mission! I hope you accomplish it all! what i look for from Real Vision is the gym experience as opposed to the golf one. There are usually huge dudes walking around, and mostly willing to offer assistance when asked for, jump in with a word of warning where safety is an issue, and give a word of encouragement because they know the work involved. thanks Raoul et al. and keep up the good work. Is this Kyle out of Portland, OR? Who were the 3 thumbs down folks who didn't appreciate a great update to a great service? They might be mistakes. The way the thumbs highlight is backwards IMO. Great job Raoul. I'm also rubbish at golf, so the analogy was not lost on me ... Totally support your plans to broaden the service (and diversify the content) for new audiences. But hope you can 'double, triple' the scale of RV without compromising on quality. Netflix is not a good benchmark for this, given the amount of "original" content they produce which is average at-best and rushed through production. I love the insight we get from Druckenmiller, Sokoloff, Bannon, Mervyn King, Mark Cuban, Scott Galloway, Jim Rickards etc etc and really hope the Series C funding is invested first and foremost into scaling-up this segment of the service, so as not to sideline your core followers... some announcements around this would be great. Perhaps some 'coming soon' trailers ...? Love RealVision and happy you are growing, just one thing as you ramp up your viewer numbers please don't say we are going to end up viewing adverts? Like Steve S below, I too jumped on the $997 lock for 3 years and now it's $180/$540!!? Also was a charter member but not really after payment issues not from my end. I dropped Macro & Think Tank as it just didn't change or up my view/understanding on investing or trading. Trade Ideas are dangerous when the presenter already has a invested position in the sales pitch and like listening to Jim Cramer---late to the party. Golf is the toughest game out there and relates to every day life. I grew up on golf since a child and th kind of people saying those negative things were never tolerated. But back then people were more gracious. Would you quit the financial world if someone said the same thing about your efforts in finance or building RV TV? The only easy day was yesterday. If the outside media world gets a hold of RV TV, it's doomed and then polluted. Young people will be totally confused. It's damn hard to put together/understand all the components of finance in the first place and they're constantly changing. Maybe add an Educational Series on how to start, what's next, then lastly how to grow oneself in the financial world. How to manage a money manager, how to keep up on regulation, how to protect principle, etc. On the Bright Side----the incredible effort and personal touch by the founders is friggin awesome! Idea conception to reality then to success is a monster task. The subscribers are super intelligent and way above my pay grade. I learn a lot reading comments. Would have loved as an early member to have participated in the future returns by RV. To be honest, I feel like a mole on Marilyn Monroe-----I'm just happy to be here! Enjoyed your comments Sam. I would note that as a very early subscriber I too jumped on the “partner” 3 year $997 offer as well and also noted that when RV dropped the price to $180 I received and extra 3 year or so extension to even things out. RV always does the “right” thing. Whenever I have had a problem I just start a conversation with Milton and that dummy has come through for me every time! Thanks Robert. I wasn't aware of the extension or I missed it. I signed up into 2020, so now 2023? Maybe RV will confirm that. Yes, I do appreciate their integrity. It only takes ONE time to bring down a reputation that took decades to build. Good to know about Milton. I guess I'm the dummy on that one. All the best Robert! I agree with Sam S. being a young investor myself. There is so much to learn, but not always a clear indication on where to start?! I've been watching Real Vision over the last few months and for the $180 it is definitely worth it. I just keep thinking, "how can I as a young investor actually make a start and grow to a point where I have financial security". I know there is no silver bullet. And I really appreciate the content and the comments! I look forward to listening reading (Community comments) and watching! All I really needed was Adventures in Finance. Unfortunately, Adventures in Finance has changed. It's now called "The Knock-On Effect" and instead of a former industry insider talking to current industry insiders we now have a couple of financial journos who are doing their best but they aren't as credible. They've never managed other people's money and for all I know they don't even manage their own. I've no reason to listen to them, so I come here hoping to find something relevant to me, but not at all sure what I should spend my time on. RV is a real hit and miss experience for me. I humbly suggest that adding yet more content is not what you need to do. Bring back the real Adventures in Finance and put it in RV if you don't want to give it away. Agreed, the presenters of The Knock On Effect don't have years of experience which is what I loved about the original RV. I'm not a big fan of that series at all. Thanks for sharing your journey with us Raoul. I fully agree on avoiding being an exclusive club. Being a Finance professional myself, I want more people to understand our field and share our passion for it. Please don’t water down the value your current subscribers love in the effort the produce more content. I understand as a business the need to scale and grow, but when advertises get involved, businesses start to pander to them. I am a huge fan of what you guys do. I wish you could support and grow the business through continued subscription model, but understand your ambitions. Keep the good stuff coming. thumbs up no. 434. After a few months of RV tv. i realized I don't have to watch everything to get my money's worth. As long as content is relevant to my needs I'm hooked because you guys do it the best. But I hope trying to be all things to all people doesn't stretch you too thin. I'm planning not to continue Think Tank. It's just too much macro, Different sources but same story over and over. If Raul says a big change is coming to it I'll hang in there. My one big suggestion. Build up a tech channel. Rv has missed so much of the cloud, big data, IoT, robotics fintech, sharing . It should be a regular feature. I think it's where your young audience is working. Woooooooo!!! Great shirt, i was expecting a beer assistant at the end to hand you a beer! As a business, we cant be about one or two people or its not scaleable but Grant is currently working on two new series while his "In Conversations with" series takes a break. Grant is so skilled that he has to do the flagship style programming, not as much of the regular programming and the things he is working on are incredible.... watch this space. 100% yes on the volume control please. I just hope we dont see the wonkier, in-depth interviews dont disappear for the more stylistic video material thats grabbing but light in content. Thats going to be tempting and if you hire from the other content providers, theres going to be a real chance that it seeps in. I still think the universities is a great subscriber universe. My son is home from IU and hes upstairs reading Barrons, Ed Yardeni, etc., services provided to him by his school. No, as I explained in the video, we are expanding the deep finance stuff even more so and then adding lots more stuff on top. There is not going to be any reduction at all in that type of content. That is our core content and will always remain so. My apologies Raoul. If I had listened an additional 20 seconds (which I just did ) I would have gotten the summation of the tiers you're going to offer and would not have put my foot in my mouth. Everyone is doing a great job there and I really appreciate the service. It's the right thing to do, everyone has to start somewhere. I spend years scratching my head trying to understand what all the financial jargon meant in my quest to be be a better investor, it was simply overwhelming and frustrating listening to the professionals speak, I'd have appreciated simplified content aimed at beginners as i learned and built up from there. Fortunately I stuck with it and have a reasonable understanding these days, thanks in no small part to being a RV subscriber from the very beginning, you guys got me into macro, I love investing with the big picture in mind, I'm sure my kids will appreciate it even more. Thanks again and don't forget those who were with you from the start!. We will never lose our core focus. It is our DNA. I’m glad you find yourself approaching the Jim Cramer approach at long last. He’s much ridiculed on this platform by many members but offers just as good as advice in a more engaging fashion for less. You guys rock. Full power! Awesome vision, Raul. I love the work you are doing. Keep it up. I don’t know about others, but I mainly consume the videos on your app. And the iPad version is sorely lacking some TLC. I see that you’ve introduced new comments functionality on the web version, but the app comments are still sorted by date (and the thumbs up/down at the top of a comment is odd). Also, if I download content for later use on a plane, I can’t seem to sort by date downloaded. Similar to the search function. Otherwise, the videos are fantastic - particularly the past few weeks. I am still waiting on your opinion of the Bannon interview! Democratizing? Maybe. But one implication of the broadening RV content has been a move away from the truly independent thinkers. We haven't seen much of Martin Armstrong, Marc Faber, Peter Schiff, Simon Hunt, Harry Dent, and their like in a while. Even Grant Williams' two best pieces of work, - his presentations at the Stansberry Investment Conference during the past two years, weren't rebroadcast on RV. In the past, the edgier guys kept the RV bulls honest. They'd also provide healthy counter-narratives to the Bassian/Banonian China-bashing. Suggestions? Haven't seen Bill Bonner, Erik Townsend nor Spengler (Asia Times) yet. Getting Gromen and Johnson back a little more often (possibly as an interviewers) might also work. Gee, criticizing is so much easier than doing! I love the golf story! I've been there.......... I have also loved every minute of my time watching RV. But I do worry with all your fund raising through VC's etc.. that you may become biased/influenced in the long run, how do you go about protecting your independence? Real Vision is fantastic! Thank you Raoul & your team for your wonderful work! Great stuff Raoul & team! Thanks for the heads up on the RV transformation. Ie. A business with a social mission rather than having profit as its main focus. Wow, what a trajectory you guys are on! Glad to be a part of it! Raoul, your a boss. Just don't become a sell-out. Great strategy! I can now tell family or friends “Go watch RealVision” on their streaming device for free to get started on the financial learning curve. I understand the motivation to grow. But of course, I am afraid there will be a push towards entertainment because of that. I've subscribed to all the three of your products as an early adopter with the hope to get deep actionable ideas. The crowd is already entertained enough with CNBC and similar gambling channels. They do not want and I honestly think the do not do not seek depth. Raoul, Please don't ever sell out. It will be the end of REAL Vision, the one place where things are REAL. Peter V you are rigth, trying to please everybody is something I want to see if it works. Yup, on the list but likely to be February sadly. One suggestion with the new format ... previously when I scrolled over an image for a show, a little summary of what it was about would appear and I could decide if I wanted to watch it or not without any further investigation ... you have eliminated this feature in the new format. Now, I need to actually click on the Show and be directed to it before I can see what the Subject Matter is ... this, IMO, is a backward step. Cheers John. Thanks. We will add it to the list of changes to be implemented. What it looks to me, ever more information but with ever decreasing value. I think you are trying to do a sell pitch, in fact it is to increase revenue for the company. More is not more when quality is going down. Raoul, still like many of your analysis but don't go for volume, Your service is far less desirable then when I signed up. Unfortunately your revenues seem to work with quantity rather than quality. Please go back to the roots of the business plan! Stanley Druckenmiller was brilliant! Thank you for that. Peter - Stan was in the last 6 weeks! Are you suggesting our quality has changed in 6 weeks? I agree with John D. A little more information on each video helps me decide whether it's something I want to watch or can skip. Firstly, great explanation. Both in terms of the what and why. Secondly, completely agree. I’m a learner and would appreciate some context sometimes. We can all learn from each other via comments. More content. Same price. What’s not to like? Oh. I f*cking hate golf too. Clear and transparent strategy update. The Netflix of Finance? Wish I could invest in you guys. Unfortunately, I'm not accredited, nor meet the financial requirements.... The Investors Podcast is something I stumbled on, for free, years ago. 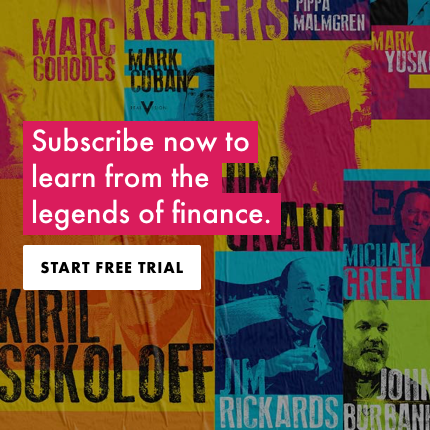 From their free content my interest in finance was sparked, I heard your Real Vision add and there goes history (one of the best decisions ever). My point...I'm sure that without a free service I wouldn't have taken the step to a paid service. Real Vision has been enormous, I'm so thankful I found you guys. I think it's great that novices will have an easier time getting drawn into something this important, with you as a resource. Great stuff Raoul & Co...keep up the great work!! You got another three years for free on top...which made it an even better deal! Really? I never received that email. It says my membership expires in 2020. Look forward to it saying expires in 2023. Then I will have to eat my words and take back what I said. Hey Kulbir, it will say 2023 now 😀 Apologies on this though. No need to take it back, we're even. Enjoy the weekend! Thank you Real Vision. Really grateful for that. Great to see that you quickly address issues and make sure your loyal customers are happy along with all of the new subscribers. Steve, please see my reply to Sam S above. Thank you for the info on the journey. Much appreciated. Best regards, M.
Yes Raoul that is why i deleted my tweet to you about preferring the old format ! Raoul, great message! But what the heck is going with your shirt? I'm all for dressing down (I'm a physician and am grateful to wear glorified pajamas at work every day) ... but "Gas Monkey"? When I see someone wearing words on their shirt, I assume they are branding themselves a certain way. Thankfully, you see fewer people these days using their clothing as large "Abercrombie and Fitch" billboards. Just curious what "Gas Monkey" means to you? Care to elaborate? Gas Monkey's a garage in Dallas that buys and restores classic rides. They have a show on Discovery that I used to watch a few years back. It's fun if you're into old cars. Haha - ok Raoul, roger that. Thanks for the clarification! At first i did not like the change of format so thanks for clarifying your reasoning, makes more sense now. Two things you can't find anywhere else in the financial media. Clarity and Sincerity. Thanks Real Vision! Please Keep the in depth content going! It’s the only place you can get it. As for access to everyone you should go buy Cheddar and have a platform to launch a tv channel. We've built the platform ourselves instead, Cheddar does not have any content worthy of the RV name. Great stuff ! I am particularly pleased to find out that you can be crap at golf but still successful in the business world, I have the "crap at golf" bit covered, I believe RV will help greatly as I tackle the other bit, many thanks ! Really clear explanation. Thanks for caring enough about your subscribers to spend the time explaining where you're headed. I'm confident about very little these days, but I do believe you guys are onto something and will succeed. Good luck to you all. Incidentally....I've got to admire the cojones of anybody prepared to deliver an eight-minute monologue to camera wearing a T-shirt emblazoned with 'Gas Monkey'! haha... and seriously, thank you. Two comments: WOW! and Yea!!! Very happy to see you guys expanding and seeing some success. Hearing Raoul talk, saying things like this, I just don't understand how it's 2018 and something like this doesn't exist yet. You are creating something that should have been created long ago. Thank you for interrupting the business of financial knowledge! Raoul...congrats on the expansion...anything that broadens your foot print, increases your attributes, grows your company and its content is a good thing. RV is the best value for money product out there in this field. If you are going to further widen the audience, that is fine and true to your mission, and if so, I would then agree with Brendan J's comment below about perhaps rating the level of content like beginner, intermediate, advanced so people can focus on the level of discourse suitable to their level of understanding, given you will be broadening the audience and its content to be even more inclusive. Also love the golf story...I am terrible at golf as well (but good at tennis), and agree with your experience of the irate golfers, like the are the sole owner, and never understood why golfers are so impatient/angry about wanting to play through...its not like they are trading FX on the course!... (apols to the friendly golfers) keep up the great work! I'm not a golfer - failed miserably at an early age. That said, I have a certain amount of sympathy for their point of view. It is one of the very few sports where all levels - from absolute beginner to pro - get to share the exact same playing surface at the same time. Frustration, on both sides, is all but inevitable. Yes, a ratings system is in design as we speak. We tend to roll out MVP versions and then clean up after getting feedback. It's a much leaner and faster approach. I totally agree, re both the high quality of RV and the relative sparsity of ThinkTank. The latter needs either bulking up or folding into RV. Watch this space. Think Tank is under entire revamp. I promise it will be exceptional. The changes will roll out in the next 8 weeks. Well.... I know Raoul! How about a 10-part series really explaining macro, such things as interest rates, bonds, yields, treasuries, how they all interrelate and how they affect the stock market and the world economy at large! A way to introduce "young people" like myself (cough cough) to the larger more in-depth topics, so we can actually have a chance of understanding them? PS - Druckenmiller was on RV? I had no idea. We are working on this. Will have an initial version to build from in the next 8 weeks. Thanks for the thoughts. Indeed, it's good that there's entry level stuff on RV, I wish I had access to this growing up. I do see people complain in the comments when something is too beneath their knowledge, perhaps there needs to be some indicator of how advanced something is? - like College course numbers or something....? Yes, definitely. Its in the plan and will be out soon.